Fish is a staple meaning that it constitutes a dominant portion (2-3 portions weekly) of the Mediterranean Greek diet. Well, you see a coastline of almost 16.000km is a constant provider of fresh fish and seafood. Lucky for locals but lucky you, guys, as well! Stay tuned for more exciting recipes! What about people living in mainland? Especially, those up in mountains didn’t have the luxury of enjoying fresh fish. The motorcar arrived on the country after WWII and even then the national road network was in crappy condition, if at all. Therefore, fishermen used to preserve their catch by salting and this procedure gave enough time to transport and sell it beyond their land. Salted cod fish was imported mostly from the North Atlantic due to the lack of abundance in the Mediterranean Basin. It keeps its flavor and nutritional properties for a very long time and it was extremely convenient to stock a generous quantity just to spend the winter. Back then, no refrigerators, obviously. These are the main reasons why salted cod fish was extremely well-known in Mediterranean countries especially Italy, France, Spain and of course Greece. From the French “Morue”, the Spanish “Bacalao”, the Italian “Baccalà”, the Portuguese “Bacalhau” and the Greek “Bakaliaros”, there is a huge variety of recipes according to the season, the local products and the traditional cooking techniques. In Greece, the consumption of salted cod fish is traced all the way back to the 15th century and it was a favorite staple for Greek cuisine. One of the most popular recipe is “Bakaliaros Skordalia”. Yeah, I know. It’s all Greek to you. He he!! Look at the title for translation and let’s cook that delicious fish the Greek way. Bakaliaros skordalia is a traditional recipe that is mainly related to two important days (for religious and national reasons) of the year: the Feast of the Annunciation and the Greek Independence day, both occasions on the 25th of March (double celebration) and Palm Sunday which is …today!! Eating fish is prohibited during Greek Easter Fasting except these two days and Greeks definitely know how to take deliciously advantage from these exceptions. It’s only 7 days before Easter and everybody is excited….Well at least in my home. We love Easter because it is a great opportunity to meet with people you love and family, to enjoy nature at its best and to taste all the delightful variety of food that Greek tradition has passed on us. This recipe indicates the beginning of Easter holidays and evokes the sting of nostalgia of tables full of people laughing, of trips to countryside with fields full of wild flowers, of the first strong sun rays after winter, of smells of all kind… and it goes on and on and on…. I found so fascinating the power of food. It wakes up all our senses, it satisfies our body and soul and it blows our mind. The deliciousness of this simple plate comes from the unique flavor and texture of the cod fish due to the salting procedure. It is almost sweet and creamy but yet fishy and the texture is smooth but chewy and the combination of cod fish and the garlic potato puree is to die for…That good!!! 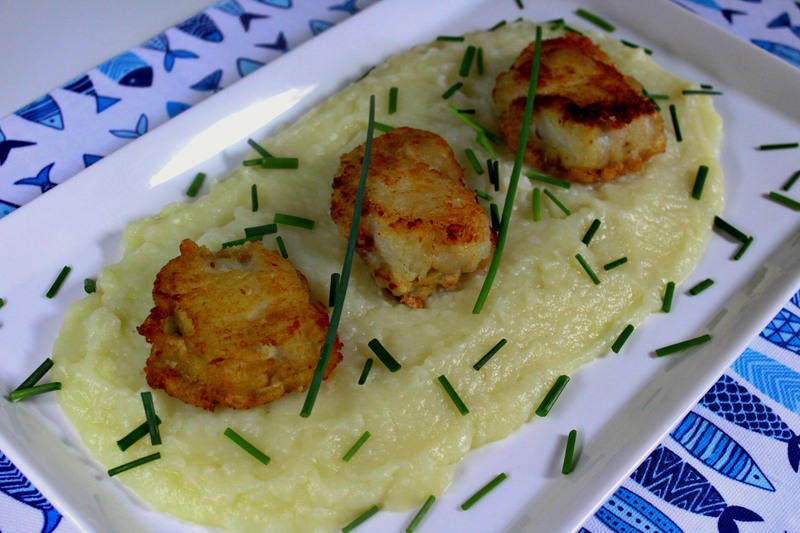 The salted cod fish is soaked in water at least 24 hours, fried in olive oil and served with the garlic potato puree. It is really simple and if you follow my tips you will get the best cod fish fritters ever. This kind of fish is easily to find in the Mediterranean countries but it could be more difficult overseas. Visit your local Greek or Italian delicatessen store and buy it at least two days before cooking. Roll up your sleeves and go!!! Soak the salted cod fish in a large bowl and wash away the first amount of salt. Use tap water and make sure it isn’t warm. Cover the bowl and put it in the refrigerator. You should change the water every 4-6 hours for 24 to 48 hours. The time depends on the amount of salt on the fish and I usually taste a small piece in order to test the saltiness. It is ready according to your preference. Wipe all the remaining water using kitchen paper. No water at all on the cod fish. Remove the skin if you want because that’s how the fritters will be even crunchier. I skip that step because I don’t have the appropriate skill and I waste some flesh. Remove all the bones. Cut into small pieces of 5 cm keeping the same size. The fish is ready for the frying batter. Follow tip #1 and # 2. In a bowl add all the ingredients except for flour. Add the flour gradually and very carefully. According to the flour you use, you will need the appropriate amount. The batter should be thick enough to stick to the fish but not too thick because the outcome will be like bread. It shouldn’t be runny because it won’t stick at all. 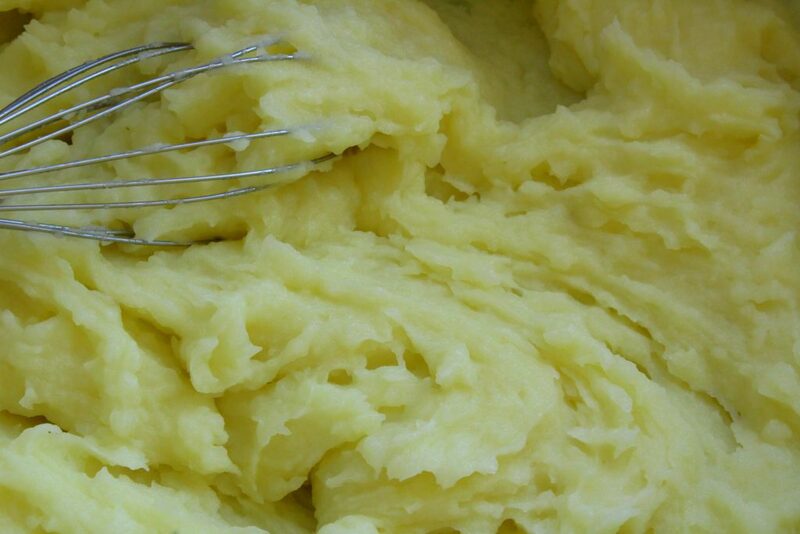 Whisk to combine until the batter is smooth. Cover the bowl and set aside for a while (10 to 20 minutes). Use a deep frying pan and heat the olive oil to high heat. Put some flour in a small bowl and take one piece of fish. Dredge the fish in the flour, until completely coated. Shake to remove the excess flour. Dip the fish into the batter, coat it well enough and let the excess batter to drip off. Don’t shake it. Your moves should be gentle. You have to be really really careful now. Hold the fish and dip half of it in the oil. Attention, please!! The oil should be hot in order to fry the fish but not that hot to splatter. So make sure the temperature is about 180*C (350* F) and test it before dipping the first piece. I usually dip a teaspoon of batter to test the oil. If you don’t have a cooking thermometer, please check the oil before attempting to fry. Hold the fish for about 5-10 seconds until it puffs up a little and then release it and let it fry. When it gets golden from one side, turn it over, let it golden again and remove from pan. It takes approximately 6-8 minutes for each piece to be ready. Don’t crowd the pan because the oil temperature will drop and the fritters won’t fry properly. Place each piece on kitchen paper. Serve them hot (I like them cold as well). Use a pot to boil water. Add 1 teaspoon of salt to the boiling water and the potatoes in pieces. Boil approximately 20 minutes but the time depends on the size of the pieces. They should be soft before removing from the pot. Drain and set aside for 10 minutes. Mash the potatoes and add the smashed garlic as much as you like. I usually add 2 gloves of garlic, the vinegar and the olive oil. 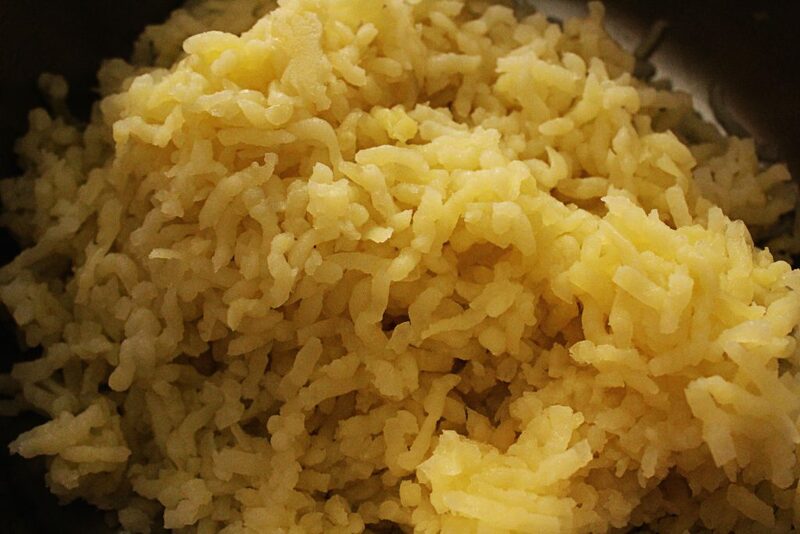 Finally, add the potato boiled water gradually in order to get the texture you like. Season to taste and add fresh onion and parsley, if you want.